Last day of the Nullabor. The treeless plains of yesterday have been replaced with sparse trees and the further west the more trees and more road kill. 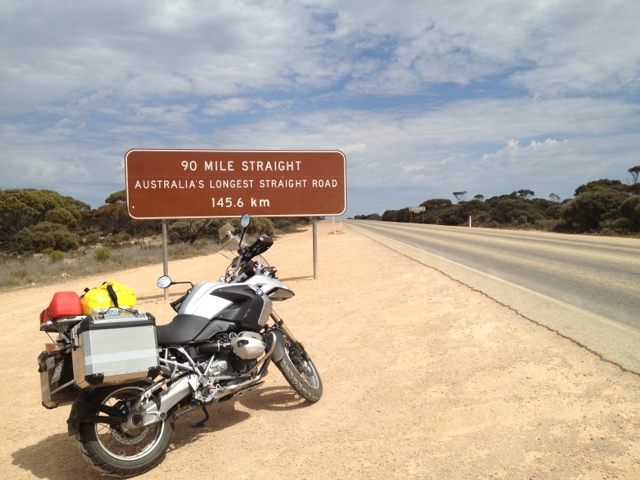 The beginning of the day saw the longest straight bit of road in OZ ie 90miles (146km). You don't really notice it as all the other roads whilst not exactly straight are straight enough that you do notice any bends. It rained a little this morning which was brilliant as all the smells of the bush came to life. I arrived at Norsenam at about 2pm which is the end of the so called Nullabor crossing (ie Ceduna to Norseman) and continued on a couple of hours to Esperance in a shocking head/side wind. My knees were in quite a bit of pain but then I have seen nthe inside of my patella and its shag pile looking cartilage so it's no wonder.